After more than a year of preparation a Drexel-led team of robotics engineers engaged in an intense two days of trying an erring at the DARPA Robotics Challenge. While the DRC-Hubo team came up short of the ultimate prize, a top-eight finish and additional funding from DARPA, the engineers learned a great deal while putting their machine to the test against some of the most advanced robots in the world. With the driving track more than 300 yards from the team’s garage, DRC-Hubo’s portability was on full display. DRC-Hubo team members carefully positioned the robot in the utility vehicle as National Geographic cameras recorded the historic robotic journey. A nearly perfect test run before the trials made DRC-Hubo one of the early favorites in the event. DRC-Hubo used a sophisticated system for collecting visual data, that included both laser sensing and stereo vision technology. The team collected its first points of the competition in the ladder climbing event. DRC-Hubo’s operators controlled the robot from a remote command center that doubled as the trailer that transported the robots to Florida. DRC-Hubo nearly reached the top of the ladder before a missed grip caused it to fall. With full representation from each of the 10 team members, DRC-Hubo had quite a pit crew to keep it up and running. A quick repair to DRC-Hubo’s head was necessary after an inadvertent power outage caused it to take a spill. The team’s third point was collected on the second day of the trials when DRC-Hubo turned the first of three valves. Mother Nature played a big part in the trials, with each robot having to carefully measure its steps while adjusting to the wind. For many of the robots, performing tasks, like walking over rough terrain, became even more of a challenge in the outdoors. Facing the challenge of performing the DRC’s eight disaster-scenario tasks for the first time in an outdoor environment proved to be one of the biggest challenges for the teams. The pleasant climes of Florida’s Homestead-Miami Speedway were often accompanied by gusts of wind – a true challenge to overcome for robots who’d worked mostly in lab settings up to that point. All eight of the testing areas were constructed on the infield of the speedway. Of the DARPA-sanctioned challenges, operating the robot from a remote location with limited communication capabilities was one that the team was well-equipped to handle. From its control center -which doubled as the trailer for transporting the robots to Florida- the team used visual feedback from the robot to direct it through each of the tasks. As the trials began, DRC-Hubo got on the scoreboard by earning two points in the ladder climbing task on day one. Hubo steadily ascended the ladder and had only the final step remaining before it took a tumble while grasping for the railing. Fortunately, the robots were wearing harnesses during each of the tasks, to prevent serious damage. On the second day of the trials, the team earned another point in the valve-turning task by twisting the first of three valves, to cheers from a large contingent of Drexel supporters in the stands. 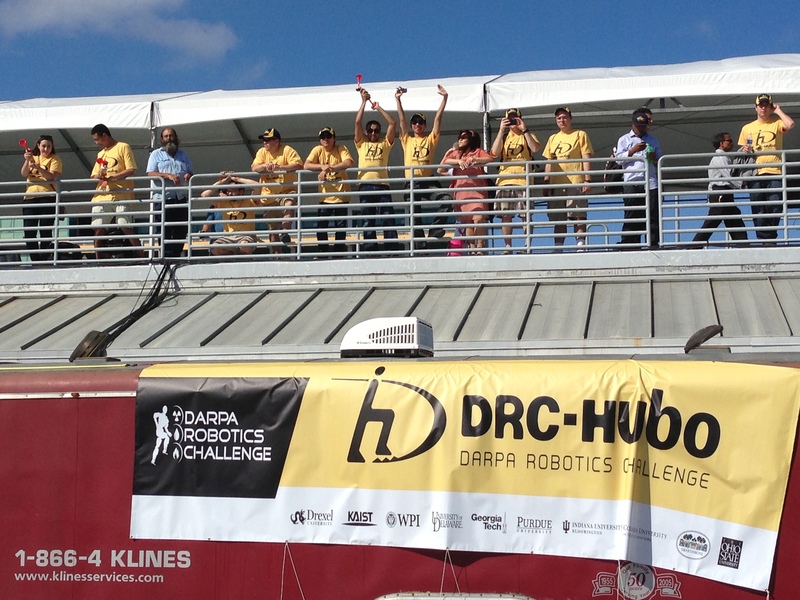 DRC-Hubo team members and supporters cheer the team’s two-point performance in the ladder climbing event. Although its three points were not enough to place DRC-Hubo among the top eight teams, who received an additional $1 million in funding for the next year of development, the team’s performance encouraged its leader, Dr. Paul Oh, to seek out additional funding for it to continue working this year and compete in the DRC Finals in December 2014.